If you’d like to understand more about how Cris Beswick can help your organisation build game-changing innovation capability and embed it into organisational culture, call me on +44 (0)8453 72 44 22, click here to email us, or use the contact form below. Either way, let's talk! "Every organisation can become exceptional by developing its potential to innovate"
That was conclusion of PwC’s 2017 Innovation Benchmark report which also revealed that 65% of companies who are investing heavily in innovation regard the alignment of their innovation work with their overall strategy as their biggest challenge. Given the huge importance of innovation to the success of any organisation, this represents a significant hurdle. An earlier report from PwC  provides us with a clue as to the reasons for this mismatch. It revealed that many CEOs see their role in innovation as one of visionary and leader rather than facilitator or sponsor. In other words, they seldom get their hands dirty in the implementation of innovation, which runs the risk of it becoming a nice to have rather than anything intrinsic to the culture and operations of the organisation. But, let’s take a positive from these findings to begin this thought piece. In my latest book ‘Building a Culture of Innovation’  myself and my co-authors comment that; ‘if it is not on the top team’s agenda, it’s not going to be in the culture.’ So the fact that innovation is on the agenda of many a CEO is a good thing, but we perhaps should have gone further and argued that it needs to be a permanent item rather than an itinerant one if strategy and innovation are to become truly aligned. Specifying objectives, developing policies, allocating resources; that is the sort of thing that most executives live and breathe on a daily basis. But, when you’re talking about moving into new markets, develop new product lines, install new customer friendly IT equipment etc. you are talking about a relatively easily defined, relatively finite ‘project’ which may even only require the involvement of a single department or team. When we’re talking about an organisation-wide innovation strategy that could, or indeed will eventually, impact on every part of an organisation, then all the evidence, both from my personal experience and from the research literature shows how hard it is for senior teams to know where to start and what their responsibilities are in terms of leading and delivering for innovation. So, let’s start by borrowing from the Hitchhiker’s Guide to the Galaxy and write the words ‘don’t panic’ in large friendly letters on the front cover of your action plan. For a start, depending on the size and nature of your organisation, you don’t necessarily have to do everything all at once. It’s perfectly possible to introduce the innovation conversation gradually, or perhaps even physically by way of a dual operating system which moves people in and out of innovation focussed teams as required. However, don’t fall into the trap of believing that just because one department has embraced an innovation mindset, you are by-default an innovative organisation. True innovation and business strategy only align once the innovation ideal has been diffused to every corner of the business. Understanding where you are today. Far too many innovation transformation programs are doomed from the start simply because of an assumed start point. So, don’t rush this stage. Take time, run focus groups, talk to your people, talk to your customers and pinpoint your current ‘innovation maturity’ level. In fact, use every resource available to you in order to build a true picture of the current state of your organisation. Taking Sat-Nav or GPS systems as an analogy, entering in a destination in order to plot out your journey is pointless if the system can’t triangulate your current location! 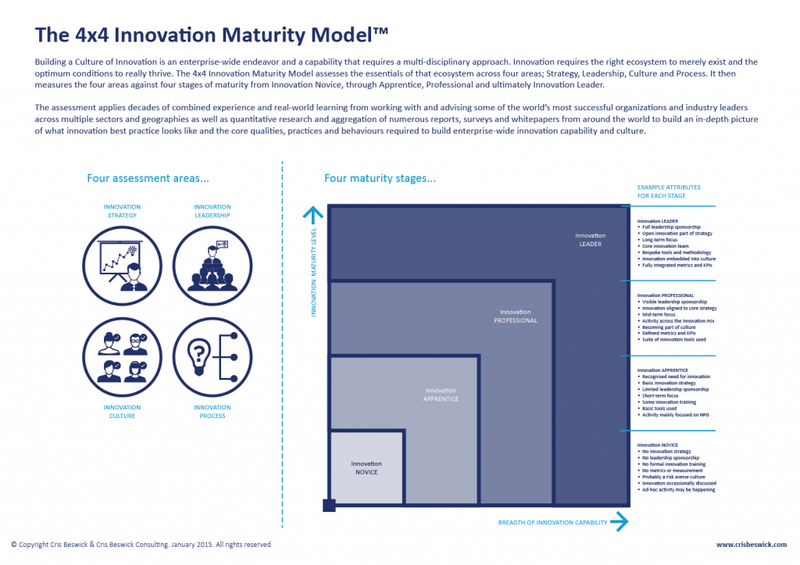 Identifying your current level of innovation maturity. One of the key components of the initial identification phase mentioned above is to identify the current level of ‘innovation maturity’ within your organisation. This can be done using the 4×4 innovation maturity model outlined in our latest book  which assesses four stages of maturity from novice through to leader over the four key areas of strategy, leadership, culture and process. For more information on measuring enterprise-wide innovation maturity see here. Creating a sustainable innovation mix. Having built understanding and clarity on the required journey you can then move to identify the ‘innovation mix’ which is right for your organisation and which ties in with your current strategic direction. Getting the mix right is key to aligning innovation activity with the strategic vision and what I call the ‘innovation growth gap’ of your organisation. Incremental innovation looks to optimise existing products, propositions and more likely internal processes and efficiencies whilst ‘Differentiated’ innovation focuses on addressing real customer problems, tensions and opportunities by adapting products, propositions, experiences and business models in order to generate genuine ‘differentiation’ and competitive advantage. Then at the top of the innovation scale is ‘Radical’ innovation which looks to develop breakthrough products and disrupt markets; the holy grail! Your ideal innovation mix will be unique to your organisation and may even vary across departments or business units depending on the optimal innovation levels required to deliver your core strategy and meet your growth gap. And never think that your innovation mix is set in stone. As your organisation evolves and as new opportunities materialise then it’s natural for your business strategy and growth gap to shift, requiring associated changes in your innovation mix. I can’t stress enough the importance of creating an innovation mix which is specifically designed to deliver your strategy. The idea of radical innovation which disrupts markets is undoubtedly compelling, giving you the chance to stamp your mark on history. But if your business strategy calls out for an initial period of quiet consolidation while you build capability and momentum then your mix should look to deliver mainly incremental innovation, perhaps with a touch of ‘differentiated’ innovation on the side. Get your innovation mix wrong and the clash between it and your strategy will exacerbate existing problems within the organisation. Conversely, when core strategy and innovation strategy are in alignment then your ability to deliver true differentiation and competitive advantage is considerably enhanced. When you understand where your business currently stands and once you’ve developed your ideal innovation mix then it’s much easier to map out the way forward, to develop policies, frameworks, governance, roadmaps and to allocate resources. 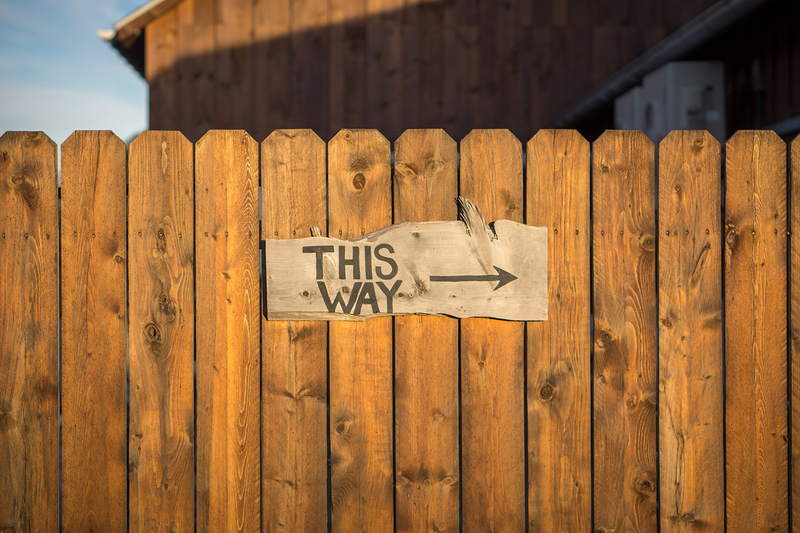 In a way, you are now on the change management trail, anticipating and overcoming objections, communicating strategies and developing ‘innovation agents’ who’ll willingly act as advocates for innovation-led change across the organisation. These are whole new topics in themselves and are covered in more depth in our latest book  or in a number of articles available either on The Future Shapers or Cris Beswick websites. Your strategy and your innovation vision are at heart two sides of the same coin, one which will deliver future success for your organisation and amazing solutions and experiences for your customers. So, if you’re a CEO or senior leader, take a breath, build understanding and get ready to design and even shape your future. This article was written by Cris Beswick for The Future Shapers and previously posted on 18/01/2018. Company registered in England & Wales.